Great mechanics! I like your dice system. This sounds damn good. Worth a try at the next open-rpg night. I really enjoyed this one! Evocative with very tight mechanics, great work! 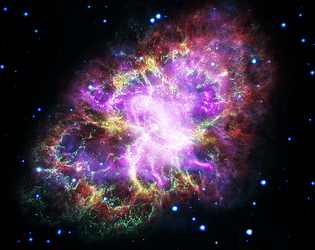 Nice use of the Crab Nebula. I didn't know a multi-wavelength image existed. I'll have to look into what they added. This is beautiful sci-fi. Cyborgs. Classic! And the balancing of the numbers? So good! That looks like you either took some time to work out the numbers, or you've been cooking this up for a few weeks. The way this is worded, though, gets confused while reading the actions. The description makes me believe we're all working on one ship, but the actions belie the "every cyber-man for them-self" motif. I can see how trying to get the wording for a collaborative effort didn't make the cut, as it's much easier to write out the details for a single player to escape. I think the fix would be to combine all the numbers of each player and then combine all the rolls of each player, if one wanted to go that route. Except, no. That's an insane number to beat. Everyone would have to have a minimum of 5 power remaining to even have a breath of chance. Wowee. Numbers, man. So difficult. Gonna try this out for realsies.